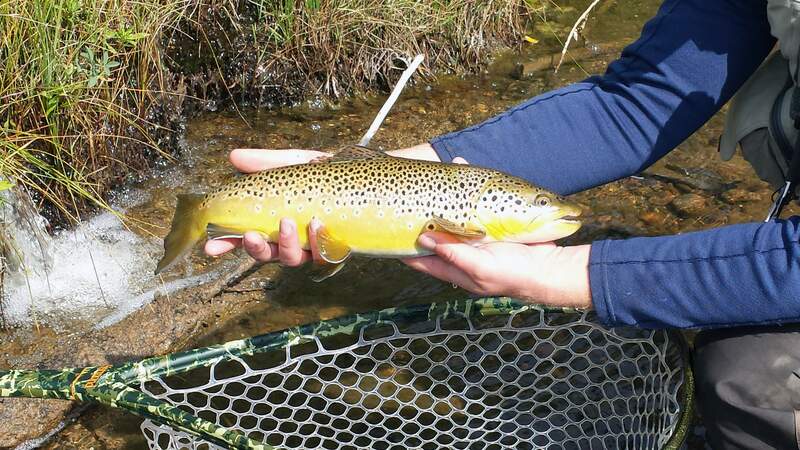 Fish such as this brown trout thrive in the Conejos River with plenty of bugs to gobble up. Catching a 5-pound rainbow trout is possible on the Conejos River throughout the summer and fall seasons, but you better be willing to get up early before the fish fill up. Driving the treeless plain of sagebrush and dead grass as Colorado Highway 17 leaves Antonito, the last thing one expects is an oasis over the next ridge. But travel mere minutes to the west, and one of the most beautiful views in the state opens before you: the Conejos River Valley. Lush meadows, thick forests, and rugged peaks abound, and a pristine river flows through the middle of this remote canyon. The Conejos emerges from fertile volcanic rock in the Rio Grande National Forest’s South San Juan Wilderness, just north of the New Mexico border. This is wild country – the last confirmed grizzly bear in Colorado was killed here in 1979 – and the area sees few visitors compared to the nearby Weminuche Wilderness. The nearest town is Antonito, and it’s as small as they come. The historic Cumbres and Toltec Scenic Railroad transports the occasional tourist between Antonito and tiny Chama, New Mexico, on a half-day journey over a 10,000-foot pass. The area’s isolation is part of the Conejos’ appeal, translating to guaranteed solitude and willing, wild trout. Even if the Conejos garnered widespread publicity, fishing pressure would likely remain light. Denver is almost a five-hour drive, and Santa Fe and Albuquerque, at approximately three hours, aren’t exactly close. The Conejos runs southeast, turns east toward Antonito, then empties into the famous Rio Grande. A dirt forest service road parallels the river from just below its headwaters, where the Conejos is briefly impounded at Platoro Reservoir – the highest large reservoir in the state at approximately 10,000 feet – to where it meets Colorado Highway 17. Over 80 miles of river – about 40 percent of which is public – offers quality brown and rainbow trout fishing, not counting the endless tributaries snaking in from the hillsides. The Conejos has wide meadows with ample casting room, a deep canyon called The Pinnacles where bruiser browns lurk, long runs, productive riffles, pocket water, deep bends and everything in between. If you prefer a certain type of water, you’ll probably find it on the Conejos. The river boasts endless insect life. Entomology surveys show more species of stoneflies than any other river in the state. This is a testament to the cold, oxygen-rich water and an almost total lack of nearby development. The Conejos is as pure as they come. Why pass up Durango’s famous fishing and make the 2½-hour haul to this remote region? The extensive public access is one reason. Although the Animas River has plenty of water up for grabs, other quality fisheries such as the Los Pinos below Vallecito Reservoir are entirely surrounded by private land. Durango has a deservedly good fly-fishing reputation, but that means you might have to share a prime stretch of river with other anglers, though it’s still nothing compared to crowds at the most famous Colorado fisheries. On the Conejos, finding solitude is never an issue. And because it’s a tailwater controlled by a reservoir with a large dam, the river brings clearer, more predictable flows and temperatures, unlike freestone waters without a dam such as the Animas. 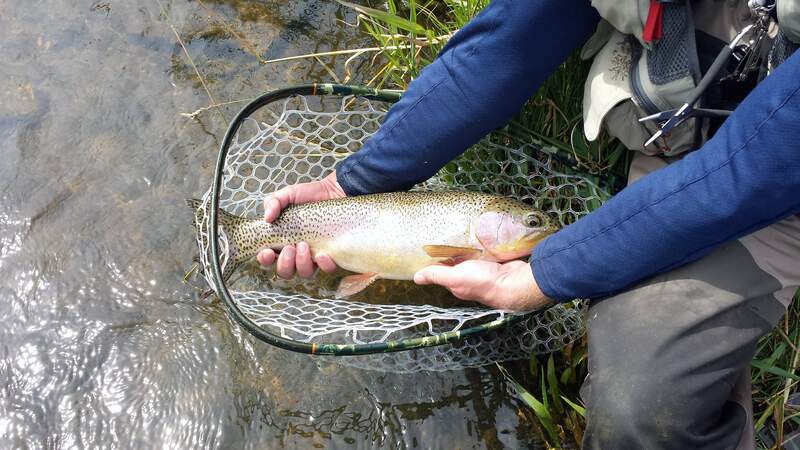 The practical fishing season on the Conejos runs from late March to the end of October, depending on weather and snowpack. Runoff occurs between mid-May and late June, and the dam can make fishing during this universally difficult time a bit more successful than on other rivers. The Conejos explodes with insects in late June and July, with the latter being the best month of the year for anglers. If it’s a light snowpack or early melt, a lucky angler might experience a hatch of huge salmonflies in June. Stoneflies will be present in good numbers at this point, and the drake hatch beginning in early July can be phenomenal with big browns and rainbows smashing dry flies the entire month. The insect buffet continues, with terrestrial action factoring in during August and September. Fall is a particularly spectacular time to visit, with even less people and thousands of golden aspens painting the hills. Jon Harp, former head guide/owner of Conejos River Anglers in Antonito, was interviewed about the Conejos on the “Ask About Fly Fishing - Internet Radio” show several years ago. Harp emphasized the need for subdued, natural-looking fly patterns. There are some exceptions, such as colorful San Juan and other locally popular worm imitations, but classic, buggy flies usually win out. Although streamers can take some of the biggest fish in the river, the baitfish population is relatively low, and fishermen mostly concentrate on nymphs and dry flies. Conejos browns and rainbows are strong fish, and they have an affinity for unusually fast water. Strong riffles that some anglers might pass up for deeper runs can harbor impressive trout, especially in summer. Contrary to some streams, where dusk is prime time, the Conejos favors early risers. Trophy fish are often caught at first light. Harp has stated Conejos trout go on a feeding binge in the morning hours, with things quieting down in the afternoon. The reason? With all that insect life, the fish simply get full. Better get to bed early. Fly Shop: Conejos River Anglers in Antonito is a full-service fly shop and guide service for the region. Pat Blankenship is the current owner and head guide, and the shop employs at least five other guides. Trips to other quality area streams such as La Jara Creek and the Rio de los Pinos can also be arranged. Rooms can be reserved at several small cabins on the property. Contact the shop at 719-376-5660, or go to their website at www.conejosriveranglers.com. Lodging: The town of Antonito offers a few inns and guest houses, including the Steam Train Hotel. Dining is limited to a small number of restaurants such as the Dutch Mill Café. The Rainbow Trout Ranch also provides lodging, horseback riding and dining for guests as well as access to private sections of the Conejos. Other local lodges, ranches, and outfitters offer similar services. Camping: There are plenty of riverside campgrounds, both private and public, with multiple Forest Service campgrounds including Lake Fork, Aspen Glade, Mogote and Spectacle Lake. More recreation: Hiking, hunting, cross-country skiing, biking, wildlife viewing and countless other outdoor activities are available year-round in Conejos County and the vast Rio Grande National Forest. The Cumbres and Toltec Scenic Railroad, the area’s biggest tourist attraction, is a narrow gauge, circa-1880 railroad with breathtaking views of Cumbres Pass and the Toltec Gorge. More information on the train is available at www.cumbrestoltec.com.